More photos scanned from the DOT collection... The first four feature more views of the Alberni from before the time it had the upper car deck added up to the early 1990's. Q of Alberni just off of Tsawwassen during trials following lifting #2 - 18 June 1984 - photo by INFocus (J Barber) DOT Collection. Clearly the vessel was not fitted with main car deck doors at that time. 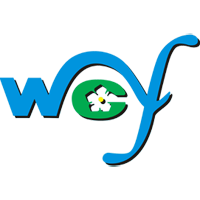 Does the Dogwood blue colour look good, or what? 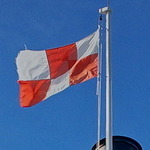 Close up - notice that the masts, painted white, have become discoloured black from diesel exhaust. There was a thread that discussed mast colour maybe six months ago. You will note that the Super C masts are currently painted white. Will they stay that way? That's a rare find right there. The Alberni Freshly painted into Expo colours and the 'North in transition. The 'Vancouver looking glorious in the old Pastel Blue as well. And what I think is the Bowen Queen all white before being re-painted. 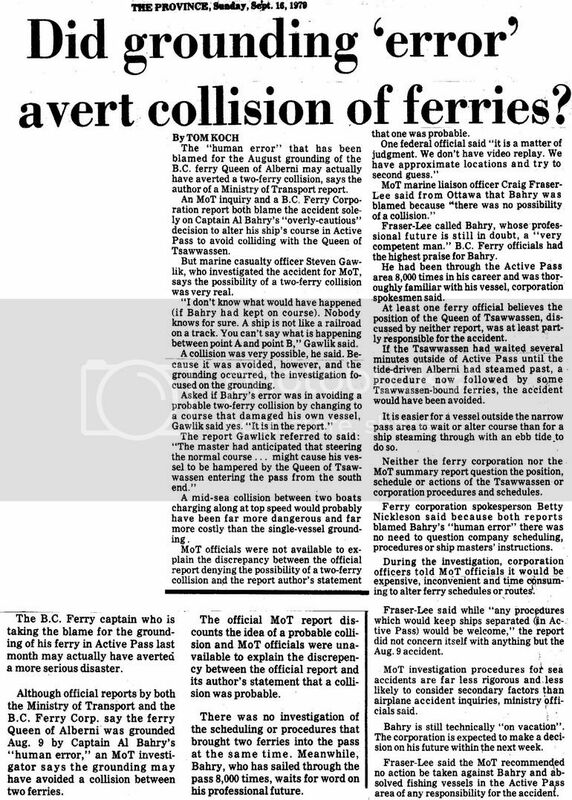 What was the Alberni doing in Tsawwassen in 1987? 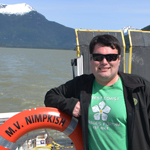 The Nanaimo to Tsawwassen run did not start up untill May of 1990. 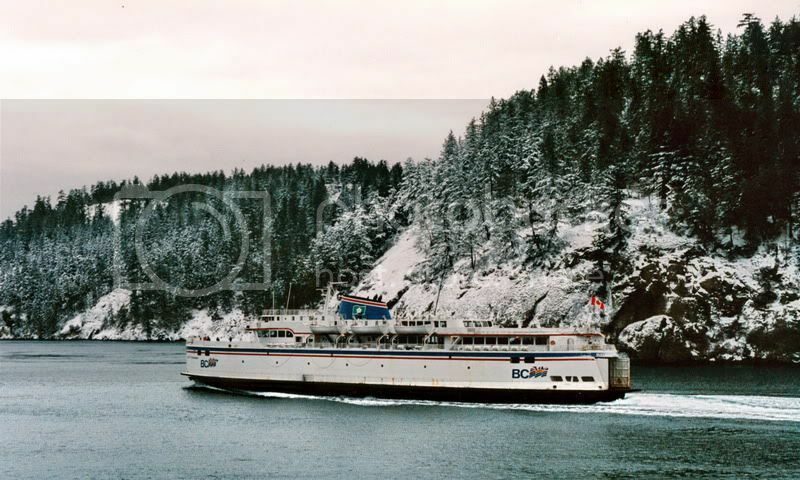 I know when she was lifted they wanted to put her on the Langdale run and she was for a while, then she was put on the Horseshoe Bay to Departure Bay run. 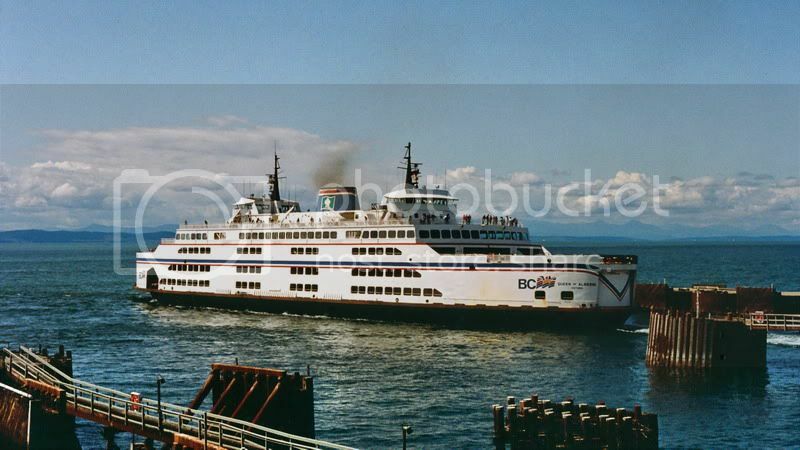 During Expo 86 the Alberni was scheduald to depart HB at Midnite instead of a 10pm sailing to allow people to come home after spending the day at expo. I remember riding her a few times when she was first lifted. Note the Location of the front windows of the Passenger lounge. She was taken to a shipyard along River Road and had her passenger deck stretched again. I have seen her at this shipyard. (The same place where the Spirit ship's Superstructure was attatched to the Hull. 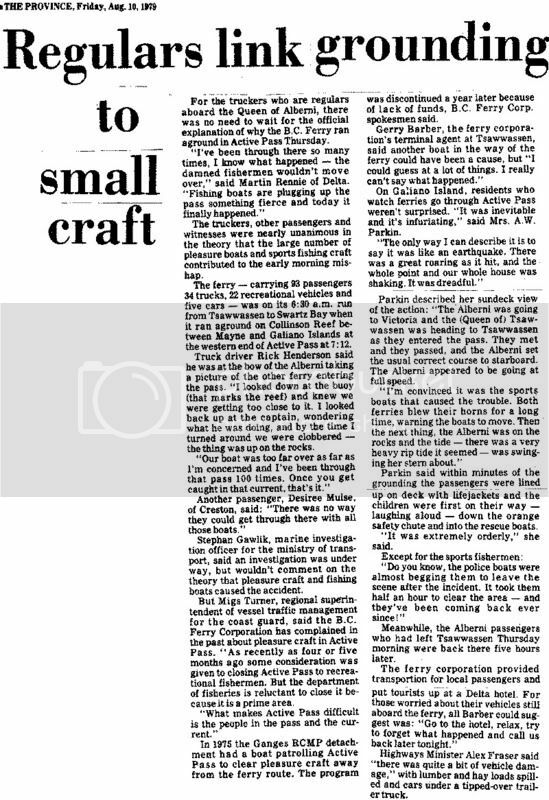 What was the Alberni doing in Tsawwassen in 1987? 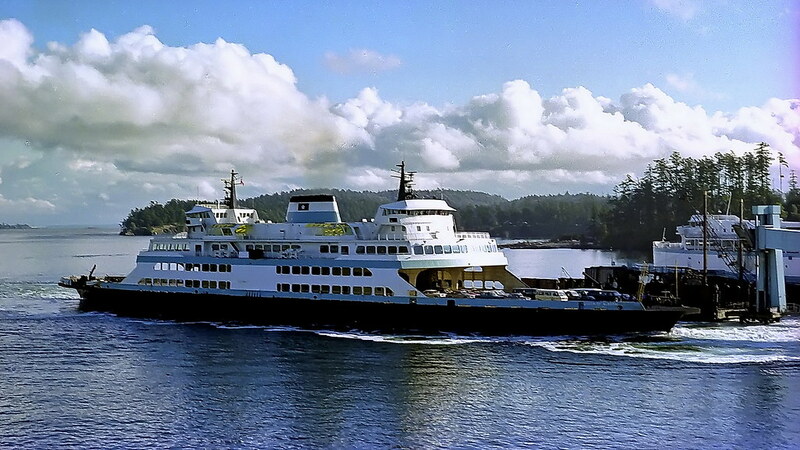 The Nanaimo to Tsawwassen run did not start up untill May of 1990. Storage? Or was she working Swartz Bay-Tsawwassen? 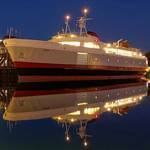 Queen of Alberni did work on the Swartz Bay-Tsawwassen Route for awhile. I rode on her when she did the route in the 70's. I AM unaware of the Alberni working route 1 with the upper car deck, or after 1984 to present but I could be wrong. 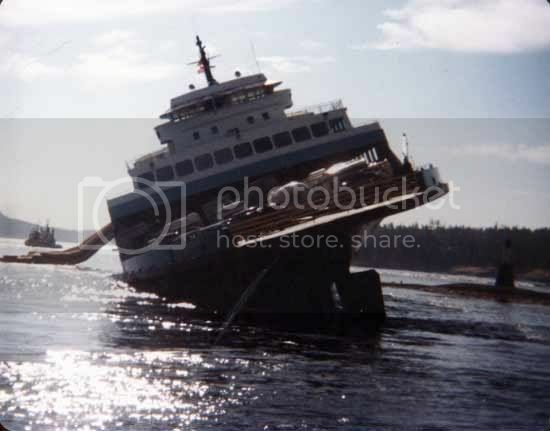 Every time I see a new picture of the Alberni aground in Active Pass, I'm always amazed that she didn't actually roll over. There must have been something about the shape of the reef that help to hold her up even at that angle. How exactly was the Alberni removed from the reef, given the angle she was resting at? Another thing that comes to mind.. How would you launch a rescue boat with that much of a list? In that picture you can see the are extended out on the high side of the ship. But I'm wondering about the boat on the low side, it would be on a good angle in its cradle and even with the line attached as soon as you would release the straps holding it down the boat could slide across the deck..
That picture was probably taken at low tide, so it would have risen a lot and made the angle less. I think I remember reading that she was hauled off the rocks late at night, which was probably to time it right for the high tide. I wonder if it would have rolled if it had been one of the other C class ships with an upper car deck, or even the lifted Alberni. I understand the B and V class ships have flatter bottoms. The Alberni photo was taken I think from the Galiano Cemetery. If is a beautiful setting with a wonderful over the pass. From what I remember, the ship was evacuated before the list got as bad as it is in that photo. When the tide lowered, her list got worse and at the time they were worried that she would roll over, but "everyone" was off by then. 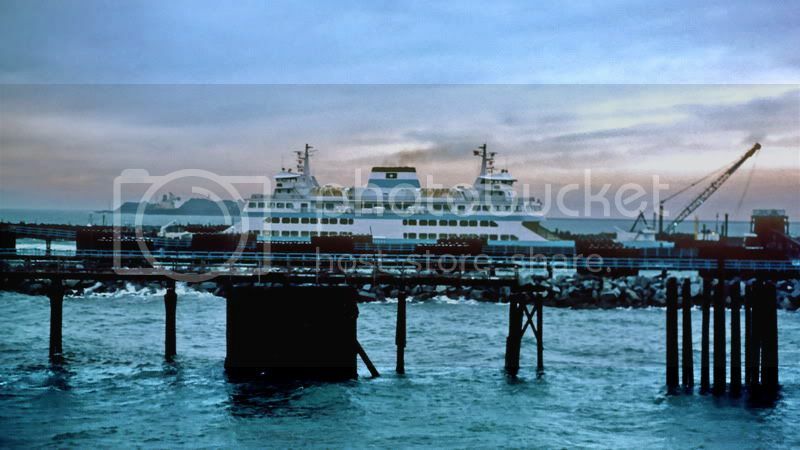 A close look at the photo reveals that the other end of the ferry was almost 'on shore' at the foot of the Galiano cemetery. Another article which I believe I posted on another thread some time ago. not much space between the reef and the cemetery at the best of times. 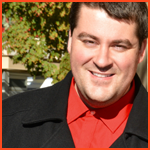 again great information and photos . - off topic: but I was surprised to see that the newspaper "Victoria Times" was still a separate entity in 1979, and had not yet merged with the "Colonist" paper. - I can't remember what happened with the Alberni's master Mr. Bahry. Did he return to active service at BC Ferries? - The "collision avoidance" theme is interesting, and it's too bad that there wasn't GPS history back in that day. - I've only now (after all these years) finally figured out where the Collinson Reef is: it's the seal-sunning rock with the beacon-marker, just in front of the Cemetery. 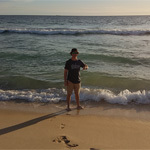 I know that place ! It is interesting that they say that Bahry was very familiar with the vessel. According to the Bannerman book "Ships of British Columbia", it was his first time sailing her. 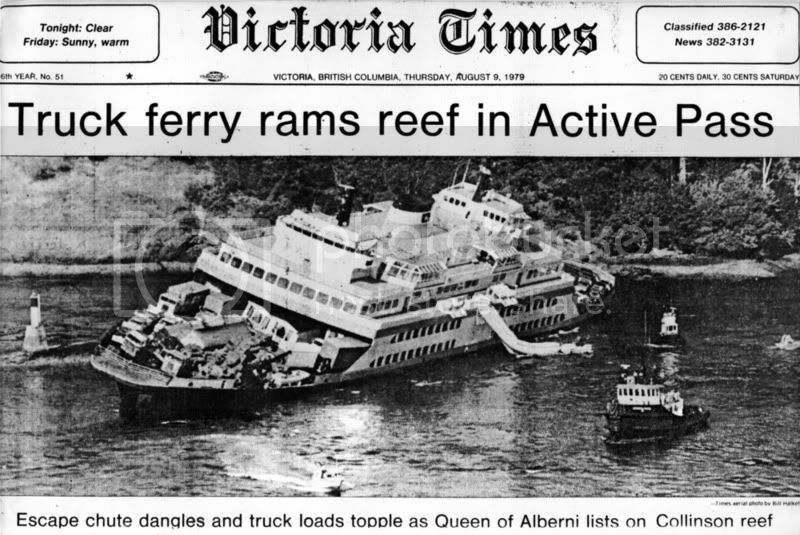 "The unhappy circumstance was in August 1979 when he took command of Queen of Alberni for the first time, a far different ship from the traditional vessels of BC Ferries. ... But a more important difference in this instance was that the jumbo "double enders" have a deep V shaped hull configuration, unlike the shallow and flat bottoms he was used to on the rest of the fleet. The 7 am sailing on August 9 was Bahry's first crossing of Active pass in this new class of ship. Midway through the pass, he heard the terrifying crunch of Collinson Reef against the hull of his ship." 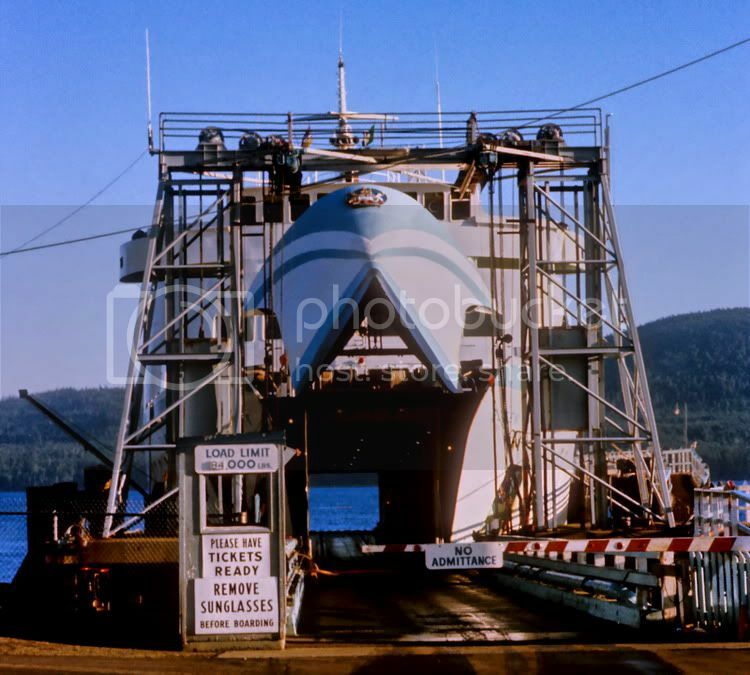 "The tribunal ruled that Bahry had committed "an error of judgement" (the mildest form of rebuke) and he was quickly reinstated by BC Ferries to full command." The above quotes are from pages 102-103. I find it interesting also, that the Bannerman book doesn't mention that the Queen of Tsawwassen was anywhere nearby. the queen of tsawwassen was nowhere at all near the scene. the queen of sidney was the route 9 vessel on this day. as i have posted before in other threads. 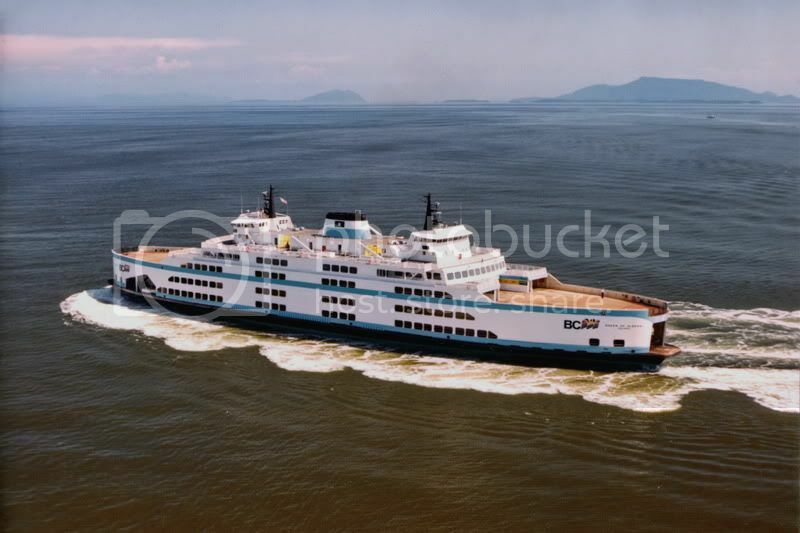 the queen of sidney held off village bay area eventually cruising up trincomli channel to porlier pass and on to tsawwassen. Well, it is mentioned in the article that was posted on the previous page in the thread that the Tsawwassen was in the pass at the time, and it was avoiding her that the Alberni ran up on the rocks. I am not saying you are not correct Kyle, as the media has always been known to be somewhat innacurate in the area of Ferry Facts, but I am defending myself saying that she was reported to be in the pass at the time. Do we know in what fashion the evacuation proceeded in terms of how many passengers used lifeboats vs the chute, or how many were willing to use the evacuation chute? 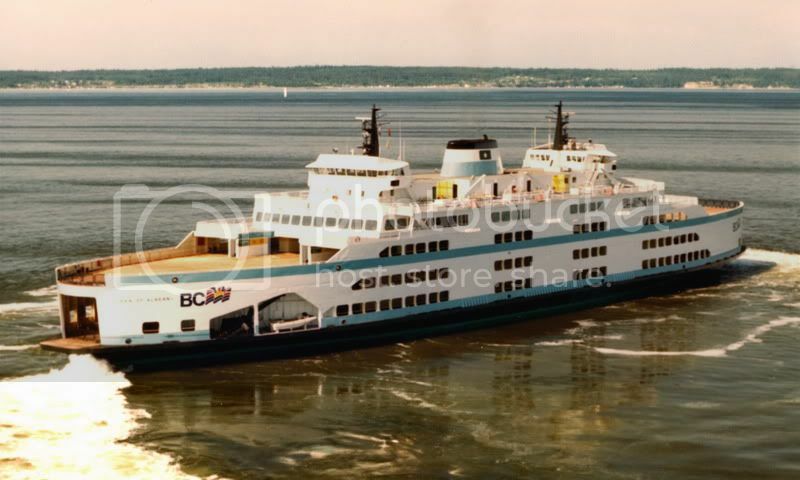 Also, whether or not the mention of Queen of Tsawwassen was correct, we do know from numerous accounts that there was another ferry there at the time. Sounds like the media need to be a little more faithful to writing the correct details in their little black notebooks sometimes, but just because they didn't we don't need to start hair-splitting each other as well. The newspaper accounts from the time all say that the Tsawwassen was there. Are you saying that they and the investigators are wrong?